We have been having such wonderful weather lately (Why would you leave Ireland if you were guaranteed a bit of sun every once in a while?). While I sat out the back and read in the summer sun himself was sitting on the couch (spread across the couch doing his best Homer Simpson impression) watching the Grand Prix in Monte Carlo. "We should go to Monte Carlo", he said when I was rustling up an ice cold beverage. Who needs Monte Carlo when we have Dublin? That's right, this weekend Formula 1 is making its way down the streets of Dublin. 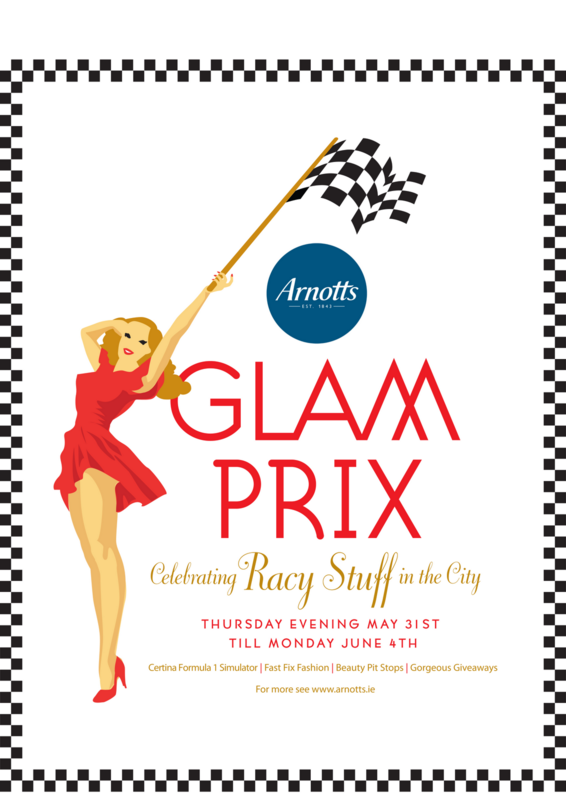 To celebrate this, Arnotts are pulling out all the stops and transforming the (already amazing) Beauty Hall into a Beauty Pit-Stop race track for the weekend. Customers will receive a race track card on arrival. This will have details of different beauty counters hosting activity at different times. Customers will receive “Stripes” as part of an “Earn Your Stripes” competition for visiting the beauty counters and receiving a stamp on their Race Card for each activity they participate in. All Race Cards returned with every stamp will go into a draw for a prize. Let the boys swelter in the heat and the noise and the ladies can race to Arnotts. 10 Minute ‘Pit Stop: Pick-me-up!’ treatments on counter for the 4 days. With purchase on any Origins skincare, receive your FREE Drink Up™ mask 30ml to quench skin’s first - it’s important to drink up while you race! Pit stop for a consultation with a skincare therapist! Spend €35 and receive a luxury sample of mini serum! Exclusively to Glam Prix, enter to win a hamper worth €400 or a facial with Emma Hardie herself! Pit stop at the Rituals counter for a complimentary Hand and Arm massage with our Ayurveda products which will be 25% off throughout Glam Prix! Let Clarins treat you to a free make over with before and after photos! Enjoy skin time cleansing treatment followed by a mini make over and automatically go into a draw to win a Clarins hamper worth €150! Glam Up with a mini eye/lip/cheek makeover from the Rouge Coco collection at the Chanel counter and receive a luxury glossy Chanel pouch! Experience the Rouge in Love Lip and nail station on counter exclusive to Glam Prix! Add a flash of colour to your lips with Clinique’s chubby stick range, perfect for that pit-stop pick me up! Life in the Fast Lane! A quick complexion pick me up for tired skin, starting with a cleanse and tone using our brand new skincare range Forever Youth Liberator, followed by an application of the Forever Youth Liberator Serum, a colour match and application of our Perfect Touch foundation and finishing with a touch of the legendary Touche Éclat. Smoky Eyes! Discover how to create the perfect smoky eye in less than Lewis’s lap time! In just three minutes, learn the three steps to perfect smoky eyes, finished with a coat of our classic luxurious mascara. In addition, receive a beautiful La Laque nail varnish in Sparkling White with the purchase of any two Yves Saint Laurent products! Meet the Bobbi Brown team who will be raring to get you racing ready with a host of beauty pit-stop make-up lessons! Come in ‘pore’ position with one of Benefit’s speedy lessons on fragrance, complexion, brows and eyes! Start the Glam Prix Beauty race in-style with a primer application and receive a gorgeous gift with purchase exclusive to Glam Prix! Glam prix style flash eye and lip makeovers based around a super summer look! For every purchase, receive a complimentary new look mascara! Jump start your Make-Up bag with top tips on how to maximise each of your products, how to get the look you want and let Shisheido highlight the bare necessities a girl needs! Purchase any product after you jump start your make up bag and receive a complimentary Shiseido vanity bag while stocks last! Be treated to Skincare and Haircare samples and a revitalizing spray of our wonderful Verbena EDT for a pit-stop style opportunity to freshen up! Take the Glam Prix ‘5 Minute Beauty Challenge'! Indulge in a selection of treatments all completed, and timed by an alarm clock, in less than 5 minutes! Treatments available will include 5 minutes to Flawless Complexion, 5 minutes lips and eyes, and 5 minutes Bronze Goddess! All customers who purchase over the weekend will enter a draw to win an Essential Summer Beauty Kit worth over €150 and 5 runners up will win a make-over with Joseph Hernandez. Make sure you have Pit-Stop perfect hair after perfecting your Pit-Stop Beauty look! Stop by the Jose Eber counter and enjoy complimentary hair styling to get you Glam Prix ready! 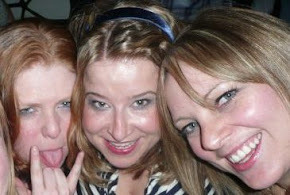 We can probably call the event a girlfriend/wife creche for the June Bank holiday weekend. 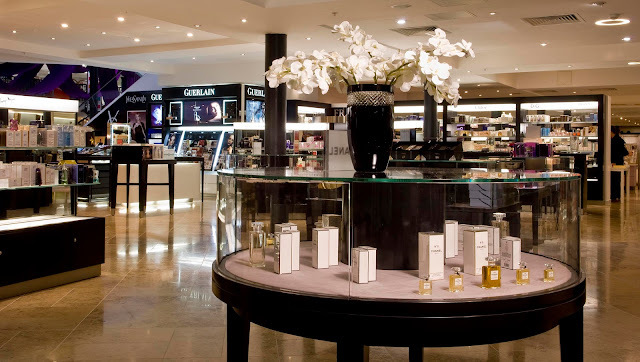 Let's tell all the men "If you're looking for me I'll be in Arnotts" and go forth and win our own race (how many of the beauty brands we get to). So many brands, so little time! The Beauty Pit-Stop race track runs from Thursday 31st May through to Sunday 3rd June, see you there. I wonder if himself will get suspicious that I am suddenly interested in Formula 1?